The Right Boots, Trail Walking Footwear & Sandals. Salomon Hiking Shoes and Boots. HANs WAGner was born in 1896 in Jetzendorf, Bavaria. He founded the company in 1921 and gave it his name. His two brothers, Alfred and Lorenz Wagner, also became shoemakers and like Hans founded their own companies: Hochland and Lowa. Our company history is all about the Wagner brothers, the development of outdoor sports over the years and Sepp Wagner, who took over Hanwag and shaped the company. On a recent Camino I met a German walker who had a pair of Hanwag boots he has had resoled three times and even the upper stitched where there was a tear. This is the first time I have come across them and since then have looked at various styles. They also have a special last for people with wider feet. They refer to as a last for people with bunion. From what I can make out they are catering for people needing wider footwear. I have looked at the company site and they explain the manufacturing techniques they use including double sticking and how critical this is to long footwear life. They also alert the readers to other who make boots who fake double stitching. It is worth looking at their videos to see how they are made and what to look for in footwear that gives the false impression of being double stitched. When you consider how expensive good boots are there are a lot of advantages in being able to have them resoled. Also we become attached to boots after breaking them in and walking thousands of kms. 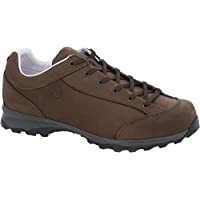 Hanwag Valungo II Bunion Casual Shoe – Mens.